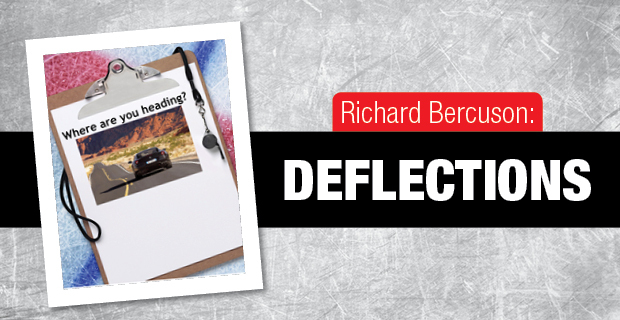 Deflections - Where are you heading? I work with an association as its lead mentor and we have spring tryouts, a new experience for me. But rather than delve into its pros and cons, let’s look at one aspect of it that is a clear benefit to coaches. We’re diving headlong into a new development program for our competitive teams. Let’s call it a curriculum, which it is. First and foremost, of course, are the objectives for the season. Since the teams are now picked, coaches will have workshops during which they will identify their teams’ needs and how they connect with the aforementioned curriculum. Had the tryouts been pre-season, in August or September, the approach used in most places, coaches would face a dizzying short time frame to make these decisions. Once those tryouts end, they’re straight into season prep mode with nary a few moments to spare. In this scenario, however, they’ll have about three months to first get away from hockey and yet still give more thought to their objectives. Whether or not these are likely to change is immaterial. The point remains: with their team picks fresh in their minds, coaches have plenty of time to shape the season objectives. Given the existence of a curriculum, they can’t just go off half-cocked with content inappropriate to the age level. For instance, in school, the grade five teacher doesn’t teach Macbeth. Interesting play, cool themes, plenty of conflict, but not for ten-year-olds. Yet this same teacher may very well address themes of conflict using dialogue in simpler forms so that when these kids reach high school, they’re better able to understand Shakespeare’s tragedy. Same in hockey: complex forecheck setups are neat. But first the kids need to understand principles of how to use speed, angling, stick position and skating skills so that the slide from atom to midget works. Our coaches have to become familiar with the curriculum. Then, using it as their road map, build a vehicle to travel the route at a proper speed. They’ll also have to recognize that having objectives in some areas means setting others aside, ones they may have wanted to cover but really shouldn’t. For example, if a pee wee AA (our tier 2 level) coach really wants to focus on skating agility and puck control, he has to realize he’ll be shifting results (ie. wins-losses) to the bottom of the list alongside some team play. Is he correct? If the curriculum calls for lots of skating and puck work, yes. Should his objectives include more team play? This is where the coach has to look carefully at how the objectives may change over the season. At this moment, he feels those items are priorities. After two months, it may all change although the foundational curriculum won’t. Regardless, you still need to have a strong idea of where you’re heading with the team next year.